This book develops new and innovative methods for understanding the cultural significance of places such as the World Heritage listed Sydney Opera House. By connecting participatory media, visual culture and social value, Cristina Garduño Freeman contributes to a fast-growing body of scholarship on digital heritage and the popular reception of architecture. In this, her first book, she opens up a fresh perspective on heritage, as well as the ways in which people relate to architecture via participation on social media. Social media sites such as YouTube, Pinterest, Wikipedia, Facebook and Flickr, as well as others, become places for people to express their connections with places, for example, the Sydney Opera House. Garduño Freeman analyses real-world examples, from souvenirs to opera-house-shaped cakes, and untangles the tangible and intangible ways in which the significance of heritage is created, disseminated and maintained. As people’s encounters with World Heritage become increasingly mediated by the digital sphere there is a growing imperative for academics, professionals and policy-makers to understand the social value of significant places. This book is beneficial to academics, students and professionals of architecture. "This is an important and timely book that proposes novel ways of understanding social value, identity and engagement with world heritage sites in the digitally mediated age. It will undoubtedly progress thinking and practice on the conception, representation and management of heritage." "Focusing on the Sydney Opera House, Cristina Garduno Freeman’s first monograph explores the persistent issue of ‘social value’. In addition to providing a sustained exploration of heritage engagements within the context of the Opera House, her book also makes astute observations that are transferable well beyond those specifics, offering fresh empirical evidence and insight into the emerging relationships between heritage, online technologies and their associated modes of communication. The result is a strongly theorized monograph that will no doubt make an impactful and important contribution to the literatures supporting heritage and conservation studies." "In this ground-breaking study, Cristina Garduno Freeman builds on thousands of images of homewares, toys, jewellery, drawings, paintings, cartoons, logos, souvenirs, maps, films, performances, events, visual analogies, archival material and even other buildings, all associated in some way with the Sydney Opera House. 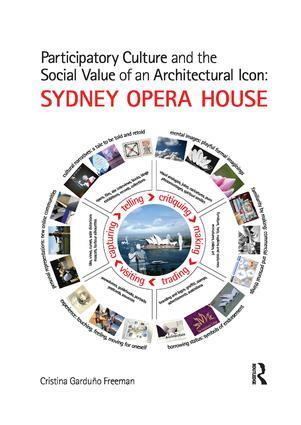 In doing this she produces an absorbing and visually exciting account of the impact of the Opera House in Australia and globally, and adds an important new dimension to the rapidly growing literatures on iconic architecture and the heritage industry." "Participatory Culture and the Social Value of an Architectural Icon is, quite simply, groundbreaking. Rigorously incorporating media, cultural and memory studies’ approaches, Cristina Garduño Freeman explores the socio-visual value of Sydney Opera House as it circulates throughthe participatory media and practices of varied audience-communities. Addressing relational, temporal and embodied aspects of architecture’s global ‘iconomy’, Garduño Freeman critically challenges established definitions of World Heritage. What does it really mean to be a ‘world-famous iconic building’ in the age of social media? This book will tell you." Cristina Garduño Freeman is emerging as a leader in the participatory culture and social value of iconic architecture. Her interdisciplinary work sits at the intersection of heritage, architecture and digital media. Currently, she is a Postdoctoral Research Fellow in the Australian Centre for Architectural History, Urban and Cultural Heritage (ACAHUCH) at the University of Melbourne, Australia. This is her first book.